Have you ever seen Donna Millard‘s amazing lampwork ? No ? Well, go for it. I’ll wait. Try not to spend all your money now ! Oh, you’re back ! Well, let’s continue this, shall we ? 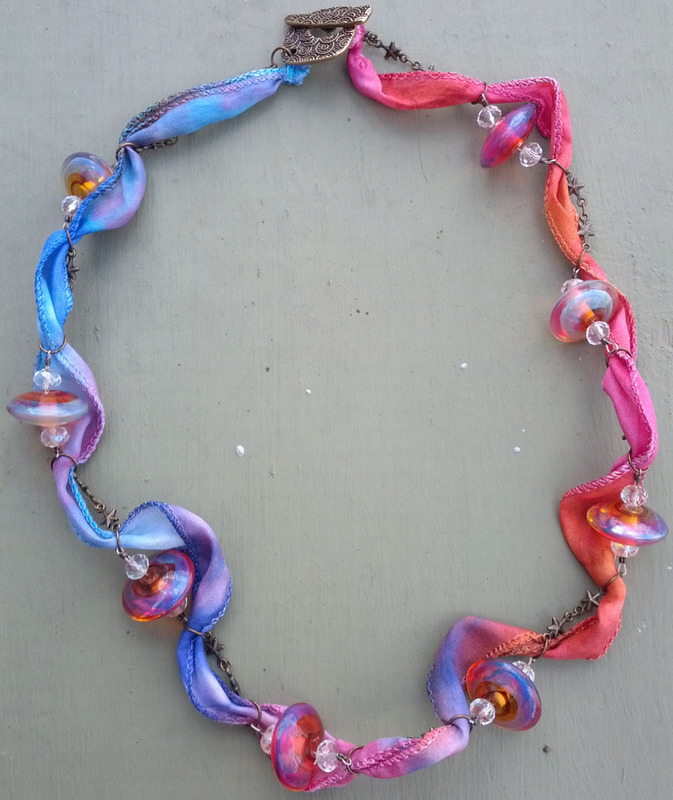 This story starts with Donna posting some of her amazing bead sets in the BSC (or was it the CBC ? Hmm. One of those two.) and I was hit right in the head by the clue fairy. With a 2×4. BUY THESE BEADS !!!! BUYTHEMBUYTHEMBUYTHEM !!!!! She yelled at me, all happiness and excitement. THIS IS WHAT WE WILL DO WITH THEM !!!!! And so, since I am known as a woman of extreme willpower and good with saving my money (HAHAHAHA)…. I brought them. Before I get to the end result, however, I want to share a little something with you. Most people probably already know this, but I figure I might as well share it with everyone else. Thanks to the lovely B’Sue, we know that one can use alchool ink pens on metal… But does it work on anything else ? Eff that noise, I thought. Being the artsy kind, I own copic markers… And I went to town. So you can, in fact, color ribbon with alchool ink pens. Blending colors is pretty easy, too, and once dry the color won’t wash off ! I just happened to have the copics on hand, but if you are buying pens just for colorizing metal/ribbon ? Go with the spectrum noirs. You will get a lot more for your money that way. And what did I use this for, you ask ? Well, glad you’ve asked ! This is where I figured out an easy peasy way to string lampwork on chain. You just do a bunch of little links with beading wire, then attach the individual chain segments to make your finished chain. I did not want to use wire for this to keep the piece as light and flexible as possible… And the jump rings also gave me the perfect opening to thread in my ribbon. Looks kind of sunset-y doesn’t it ? At least that was what Donna’s lovely beads reminded me of <3 The star is actually brass chain with tiny little star link. I resisted getting this chain for a long time, but when I did finally start to use chain more and more in my work, I finally did cave in. Beautiful – doesn't even begin to describe your work! That is awesome! 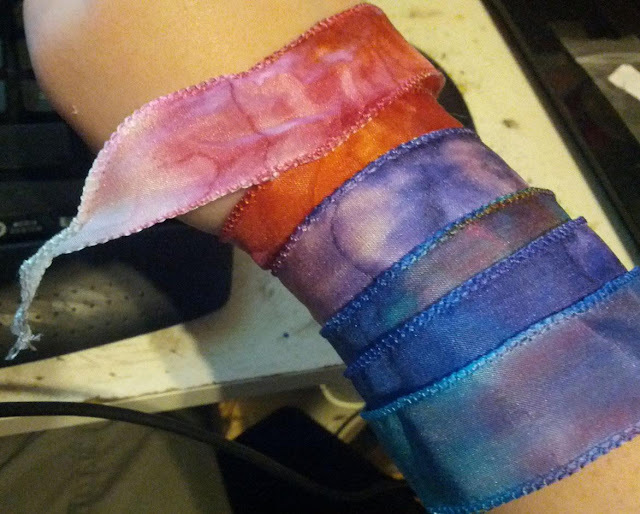 I love the way the inks look on ribbon! I am going to have to try that. Thank you for sharing!